About | Lynk Labs, Inc.
Lynk Labs was the pioneer and first company to take AC LED technology into the general lighting market. 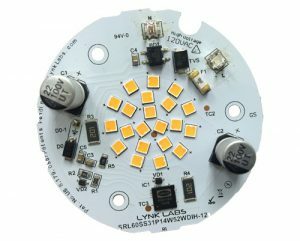 Since 2002, Lynk has built a broad patent portfolio of technology surrounding various forms of AC LED and DC LED technology from core AC/HV LED circuit level on up to the system level and everything in between including packages, modules, lamps, drivers and drive methods, optical designs and more. Our core mission has been to become the industry leading provider of technology and components that simplify the challenges of integrating LED technology into the existing embedded global AC powered lighting infrastructure while increasing reliability and reducing cost. Today, Lynk licenses some of the company’s IP, and designs, develops and manufactures AC LED Packages, Lamps, Assemblies, Drivers and Systems for OEMs and End Users. As the leading pioneers of the AC LED market, Lynk Labs today has the broadest, most diversified patent portfolio and technology offering in the AC LED space. Lynk’s technology can be found in some of the market leading LED lighting devices, lamps, drivers and lighting systems.